An apple a day Keeps the ghouls away! Halloween is coming up and we have some healthy spook-tacular sweet treats for parties that are fun and easy to make. 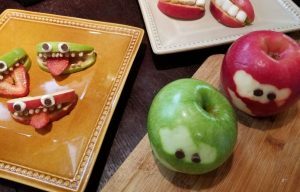 Here are 3 Spooky Halloween Apple Recipes that’ll make this time of year fun and exciting. An apple a day Keeps the ghouls away! Halloween is coming up and we have some healthy spook-tacular sweet treats for parties that are fun and easy to make. 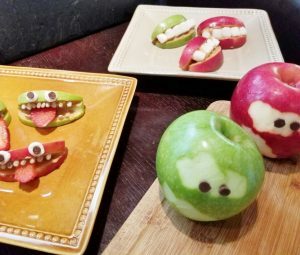 Here are 3 different ways to turn your apples into Halloween inspired creatures- Apple Mummies- that’ll make this time of year fun and exciting. Using a vegetable peeler, start to peel the apple in strips all the way around the apple. Cut the apple in half vertically. Remove the core. For the eyes, take the mini chocolate chips and press them into the apple using the pointy end. Place them where the peel has been removed. 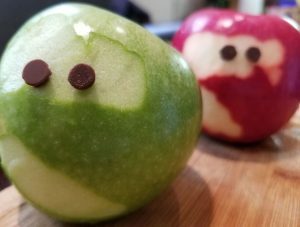 (TIP: if the chocolate chips do not go as deep in as you would like, use the tip of a paring knife to make a small hole in the apple for the eyes). 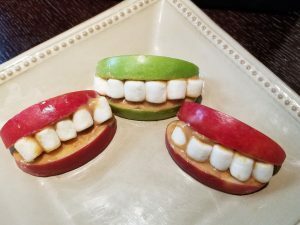 These Apple Marshmallow Teeth are fast and easy to make. They'll be a great on-the-go snack or a small bite to eat at your Halloween party. Cut each apple into ⅛ slices. Spread peanut butter on one side of each apple slice. 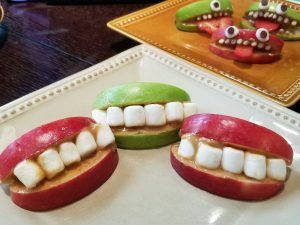 Line 5-6 mini marshmallows on the peanut butter side of one apple slice, then cover using another apple slice. 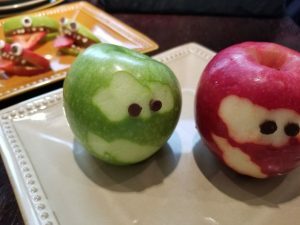 These Apple Monsters are cute and easy to make. They’ll be a fun and nutritious treat at your Halloween party. Cut each apple into quarters and remove the core. In each quarter of the apple, cut a “V” shaped wedge out for the mouths of the monster. Cover the inside of the space with peanut butter. For the teeth, take sunflower seeds and place them on the top and bottom. For the tongue, cut the strawberry vertically making slits and insert them into the “mouth” of the apple. For the eyes, take a mini marshmallow and cut them into thirds horizontally. Take one chocolate chip and pierce the center of the marshmallow, then push the chocolate chip point into the apple; where the eye(s) would be. We enjoy the “Kids in the Kitchen” along with the spooky Haloween treats. Thank you for your many ideas.